Indonesia 2004, Chile 2010, Japan 2011: Sizable earthquakes caused Tsunamis that rippled across the Pacific Ocean affecting far more people than just the ones close enough to feel the tremors. When one Pacific Rim country experiences seismic activity, other areas along the rim will have an event in the very near future and frequently that means Tsunami. It’s just as important to remember that the Atlantic coastline and even the Gulf of Mexico are just as likely to catch a Tsunami generated by a variety of possible events. Before we get into reaction steps, let us say this about Tsunamis: When you hear a warning of something as “small” as a six-foot wave, don’t think of the tall wave that rises up and crashes on the sand at the water’s edge. The concept is more like the sea suddenly rising six feet and a wall is coming at you at 300 miles per hour. If this happens, are you ready? Do you know what to do when 20-foot W.A.V.E.S. come racing inland? Warnings – Does your area have official Tsunami warnings? Would you recognize natural signs? Altitude – Where would you go in a Tsunami? Tall building? High ground? Vehicle – How will you get to high ground? Is your evacuation vehicle ready to go? Do you have a Plan B? Evacuation – How ready are you for an evacuation scenario in general? Safety & Secondaries – Is the primary emergency the only emergency that’s going to happen? 1. In the past several years, especially since the 2004 Indonesian earthquake and resulting Tsunami that hit Thailand, warning systems including seismic sensors, Tsunami detecting buoys, and communication and warning systems have been improved dramatically. If you live (or are visiting) near an area at risk for Tsunamis, have you stopped to learn about the official warning system? Who gives it? Will they give you any instruction? What does the siren sound like? 2. In some instances an incoming Tsunami will draw water away from a beach as it heads toward shore. In fact, in 2004, an Australian Life Guard working in Phuket, Thailand knew what it meant for the tide to go out farther than normal and he managed to clear his beach and get guests to safety. Keep an eye on the tide, but don’t go to the beach to look at it. Stay away if a Tsunami Watch (and especially a Warning) is given. 1. One term you’ll hear is “vertical evacuation.” This means go up, either to upper floors in a strong building, or to high ground. 2. Where is the destination you’d go in a particular area? One habit to get into, regardless of the emergency or where you might be, is to look around for emergency warning signs or systems, gear, shelter, supplies, and evacuation destinations. Make it a habit of yours where ever you go regardless of potential threats you may face. 3. Look around your area and remember which buildings are more substantial. Some may actually have Tsunami info posted telling visitors that in event of a Tsunami they are either to head to upper floors (but NEVER use the elevator!) or to vacate the building in favor of a different location. 4. Some locations will identify Tsunami evacuation roads and will have specific destinations for motorists. 1. In any evacuation scenario you may have to rely on your primary vehicle to get you out of harms’ way. Is yours ready? Do you always have your keys on you? Do you keep the gas tank full at all times? In Tsunamis past, we’ve seen footage of people lined up at gas stations. This is severely wasted time, and in any emergency time is our biggest asset. Keeping your gas tank full at all times not only helps your family by allowing you to get to safety quickly, it helps others because you’re not one of the people in line at the gas station. 2. Though we mention your vehicle here, we’ll revisit the fact that your evacuation destination might well be an upper floor of the building you’re in. Your decision on whether to go to an upper floor or higher ground location should be dictated by A) Time – how long before the first wave hits and how much time you might need to get to another location, B) Where you’ll be the safest, C) Road conditions and current traffic since you don’t want to be sitting unprotected in gridlock traffic, D) Whether or not you need to provide safety to others, and E) Where are your safety supplies and gear? 3. Though your primary vehicle should be your first choice, what if you cant’ get to it? Do you have a Plan B? Are local busses or other vehicles getting people to safety? Is there even time to look around for other transportation? Do you have a bicycle (an early warning and a bicycle will get you farther than standing around not reacting at all)? In an emergency, options are our friends. Know your options. 1. A Tsunami is an evacuation scenario if there ever was one. How ready are you to perform an evacuation at all? Since time is our most valuable asset, how much time have you saved by having a pre-packed kit for each family member and pets? Are you ready to “grab and go?” Do you have your “bugout kits” ready? 2. As you contemplate heading to upper floors or higher ground (now, while we’re discussing this academically and it’s not an actual emergency), remember that this scenario is an evacuation that is coupled somewhat with shelter-in-place reactions. Therefore, you want to be equipped and ready for both. So… where’s your kit? What does it contain? Will it help you get out of harm’s way as well as sustain you once you get where you’re going? Do you keep a kit at home, at work, or in the car? Maybe you have items at all three locations? Remember this too, that if you’re simply climbing the stairs to upper floors in the same building (NEVER use the elevator) that it’s still an evacuation and you should carry your gear with you because when the emergency occurs, you may be left with only what you have with you. 3. Since time is one of our most valuable assets in any emergency, what do you have in place that will help you save time in this scenario? We mentioned keeping your car gassed and ready (sitting in line at a gas station is not a model of an efficient evacuation), and we just mentioned your gear. How about knowledge? Do you know where you might go? Do you have hardcopy maps in case the smart phone isn’t working or the cell towers are down? Do you have alternate ways to communicate with loved ones if primary communication methods don’t work? 1. Misery loves company, so one of the key points to keep in mind is that a major emergency is probably not going to be the only emergency. You might have made it under a table in time during the earthquake, but what about the dam up the river that was cracked and is about to break? What if there’s a panicked evacuation and you or a family member are injured? How ready are you for that? Do you have your first aid gear? Are you trained to use it? Do you have gear for only your area’s most likely scenario, or are you ready for an all-hazards scenario? 2. Need a list of things to keep in mind? Tsunamis don’t just happen. They’re usually triggered by earthquakes. So, when the earthquake hits are you going to automatically think “Tsunami?” How about fire? Fire is all too common an occurrence after destructive events – even floods. And floods? Tsunamis aside, what if the dam breaks after an earthquake? Do you know how many dams there are in the US alone? 3. The main point here is to be ready for “the other shoe to drop.” Maintain your composure in the first emergency by being prepared so that when the second emergency crops up you’re able to handle that as well. Though just a small, small section of Disaster Prep 101, we wanted to pass this along to make you think of two things. 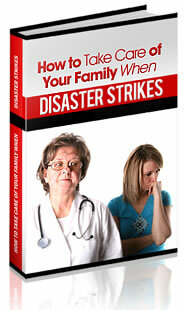 One, disasters are survivable if you’re prepared. Two, there is so much more to know with Tsunami preparedness (or any disaster) than an academic discussion of how the event occurs – which is pretty much all we’ll get from most news channels. How ready are you? Did the news give you a good wake-up call?